So for those of you that follow me on facebook as well you'll have seen my recent pic of my China Glaze collection. There were 57 in total but take away a top coat, a glow in the dark top coat and fair dust and 54 is the real number. I've now set myself a challenge that in the next 60 days I have to use all these polishes at least once in some way shape and or form. Immortal was from the Halloween 2012 Wicked Collection. Lorelei's Tiara was from the 2011 Eye Candy 3D Collection. 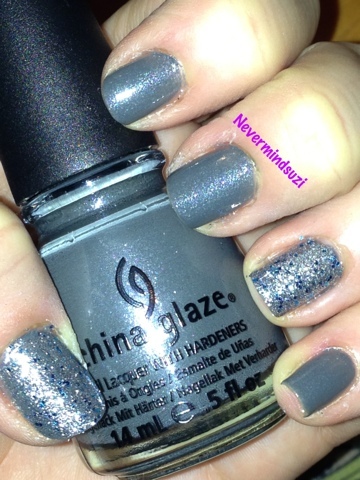 Immortal is one of my fave greys, look at that blue/silver shimmer running through it! Lorelei's Tiara is also a 1 coater glitter! Perfect combo...? I think so!